South Kingstown High School canceled a planned civic forum between House District 34 incumbent Democrat Teresa Tanzi and Republican challenger Stephen Tetzner, after controversy erupted over the date, the proposed moderator and the Tetzner campaign’s treatment of a student planning the forum. The move comes weeks after Tetzner sent out a campaign mailer using a body double of Tanzi, alleging she “broke her word” regarding a plan to hold a series of debates. 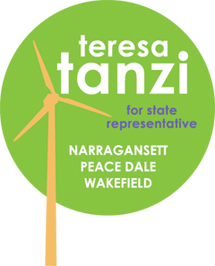 In July, Tetzner sent out a press release challenging Tanzi to a series of five debates. He said he sent the challenge to Tanzi by registered mail July 15. In September, he sent her a second challenge for a debate, this time using a registered courier to serve her the paperwork. His postcard mailer went out Sept. 15 to residents of the district, which includes Narragansett, Peace Dale and Wakefield. It depicted a model – with hair similar to Tanzi’s – with her back turned. The postcard said Tanzi had been challenged to a series of debates “for two months” and alleged she “broke her word” after agreeing to participate. Tetzner had a graphic designer, ScanlonDesign of Massachusetts, begin laying out an advertisement on Sept. 1, he said. The final advertisement was mailed Sept. 15, according to an Oct. 14 letter from art director Franis Scanlon, which he provided to the Independent. Tanzi said in mid-September, a “civic event or debate” was tentatively scheduled – and promoted on the school’s website – to be held Oct. 8 from 3 to 6 p.m. University of Rhode Island Political Science Professor Maureen Moakley was scheduled to moderate. Tetzner later said he was not contacted before the planning had begun to confirm and was not available at that time. Tanzi confirmed high school senior Glenn Yu took the lead in the planning. In a letter to the editor sent to the Independent (see page A7), Yu alleged Tony Pesaturo, Tetzner’s campaign manager, “ridiculed” him when he tried to set up the forum. Yu maintains Pesaturo called him back mistakenly, and was again rude. Yu contacted Tetzner the following evening, and the candidate apologized for Pestaturo’s actions, Yu wrote. In his letter, Yu said he received Tetzner’s campaign mailer Sept. 19, two days after Yu had contacted Pesaturo. In the interview, Tetzner said a debate offers a chance for candidates to respond to each other’s comments, rather than a forum or civic event-style forum, where a moderator asks questions of candidates, and no direct challenges to answers are allowed. He preferred the debate style and said a “civic event,” should be for students only and not open to the public. He added he did not believe Moakley would be an acceptable moderator and provided Yu and the Independent with a list of “professional moderators” he would find acceptable, which included Mark Curtis from ABC6 and WPRI’s Ted Nesi. On Sept. 23, Tetzner claimed South Kingstown High School Principal Robert McCarthy canceled the potential event, and ended any possibility of a debate. McCarthy did not respond to a request for comment by press time.